Rely on the service of expert energy assistance. Incorporate the larger vision that goes beyond pricing alone. Don’t assume your bills are error-free. Let UtiliChoice review and uncover lost savings, errors, and found money. Each segment of the UtiliChoice Core Four provides opportunity to drive down energy costs. Competitive Electric and Natural Gas supply offers one of the greatest opportunities to save and the vast majority of commercial and industrial customers have already made the switch, while new market opportunities arise on a continual basis. With the electric grid under stress as demand grows, the heat intensifies, and the government effects the shutdown of older polluting sources of energy, utilities are turning to Demand Management to balance the system. Consumers can choose to reduce consumption during stress events and get paid for cutting back. Another essential element in driving down your cost is found in Efficiency upgrades. There are rebates and incentives available for a broad menu of efficiency improvements. None of these are Set-it-and-Forget-it matters. It takes a team of dedicated personnel to stay up-to-speed and keep your savings in high gear. While it’s not impossible to get a lower price on your own, the circumstances would likely need to be unique. The rule generally applies that the best pricing is offered to the largest load volumes and being that the retail sales of energy is tailored to the outside broker model, there are not a large number of accounts that would more greatly benefit by being on their own. If this is the case for your business, UtiliChoice can point this out to you and show you the difference between going it alone and creating a group. FAQ: Will we get a better price by combining multiple facilities? ANSWER: Almost always. The reason is that energy is just like any other retail purchase. The benefits in economies of scale apply here as well. 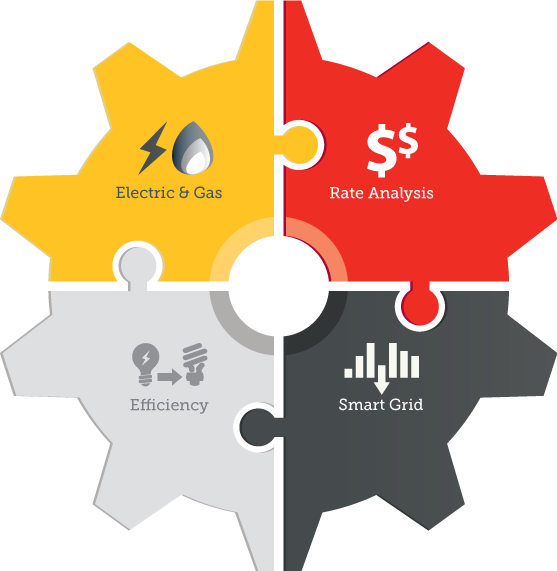 Buying electric, gas, or installing efficiency upgrades in larger quantities drives down costs. Let’s face it. Doing paperwork can be a pain–especially if you have to educate yourself in order to do the paperwork. Rebates and incentives are no different. While there are a number of great cost savings programs available, navigating them, understanding them, and participating can be overwhelming. UtiliChoice can handle all the work for you leaving you the time to focus on what already needs your attention. FAQ: What kind of rebates and incentives are available? ANSWER: Many! The list is long. There are federal programs, state programs, and even local programs, as well as programs that many utility companies offer. Compiling the applicable rebates and incentives is an individually tailored process we handle for each facility. In an organization, there are usually a wide variety of knowledge levels when it comes to energy. The facilities director may know a fair amount, while the CEO is interested in making wise decisions, but not up-to-speed, and the VP of Finance knows it’s smart to look into the savings opportunities available. Each one is a microaudience that could benefit from different information. The ability to create custom materials on-demand allows us to tailor the content to what’s most applicable for each participant or group in the process. FAQ: Do you have any information that you can send us? ANSWER: We can do better than that. We create custom information pieces by request to serve your specific needs. This allows us to best allocate the information that is appropriate to include for the target audience in your organization, whether it be a brochure, a presentation, a white paper, or anything else. We tailor the materials for each audience to both educate and empower your organization to develop and enact a forward-thinking energy strategy. More than 20 states and provinces now have electric choice, or direct access as it is called in some places. FAQ: How many businesses have switched from the local utility? ANSWER: Over 50%. Where choice is available, the vast majority of businesses switch. In fact, generally over 80% of large businesses switch suppliers, and over 50% of small and medium businesses switch from their local utility to an alternate electric supplier. UtiliChoice offers a comprehensive approach to your energy outlook. We tailor everything to the unique characteristics of your business in a process geared to your satisfaction. Let us work for you.